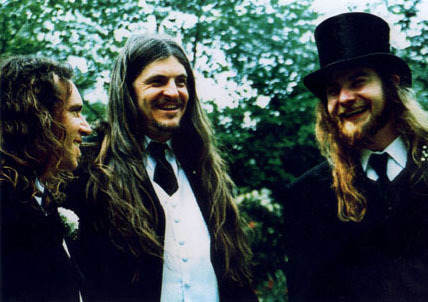 Scott “Wino” Weinrich formed Spirit Caravan after the breakup of The Obsessed. The remainder of the band consisted of Dave Shermann (formerly of Wretched) on bass and vocals; and Gary Isom (formerly of Unorthodox) on drums. Weinrich credits them for encouraging him to join the band and become active musically again, after he had abandoned his music career. The band was originally entitled Shine, and they released a demo and 7″ under this name. They were forced to change to the band’s name when another band of the same name threatened legal action. 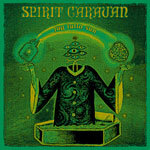 They changed their name to Spirit Caravan, after an Obsessed song. The band had a lyrical emphasis on spirituality (though not necessarily religion) and global politics. The band split up in 2002 but have reunited for US tour dates and European festival appearances in 2014. After the band’s demise, Weinrich joined Place of Skulls and founded The Hidden Hand. After The Hidden Hand’s demise in 2007, Weinrich rejoined the reactivated Saint Vitus. Sherman went on to found the band Earthride. Isom joined Internal Void, Pentagram, Valkyrie and Nitroseed. Their song “Dove-Tongued Aggressor” was featured on the Tony Hawk’s American Wasteland soundtrack. Numerous songs by Spirit Caravan were also recorded as songs for The Obsessed. “Kill Ugly Naked” from Jug Fulla Sun appears on various demos and live recordings along with the “Incarnate” compilation. “Melancholy Grey” from Jug Fulla Sun was written in the same sessions as 1994’s “The Church Within” and appears on the 2013 reissue of that album.”Higher Power” from Dreamwheel appears on the Obsessed’s 1982 demo. “Spirit Caravan” from Elusive Truth appears on “Incarnate”. “Lifer City” from Elusive Truth appears on various demos and the unreleased Obsessed LP sent to Metal Blade. EXILE ON MAINSTREAM teamed up with the band in 2014 to release their debut album “Jug Fulla Sun” for the first time on vinyl after 15 years of its original release. It was a one-time only pressing and is sold out.